Monterra Blend Hexagon Glass/Stone Blend Mosaic Wall Tile, it's easy to add a splash of contemporary styling to your decor. This attractive tile features a 3 in. hexagon chips arrangement of glass and natural marble tile strips on a 12 in. x 12 in. mesh sheet that makes installation a much easier process. With neutral beige tones, this tile creates a distinct pattern. Ideal for use on interior and exterior walls, the mosaic has infinite applications to complement a variety of installs. 10 square feet, 10 pieces per case. Case weight is 50 lbs. 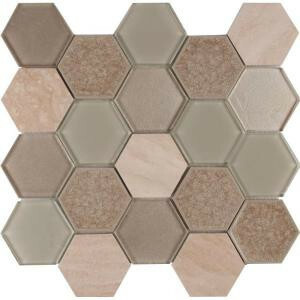 Buy online MS International Monterra Blend Hexagon 12 in. x 12 in. x 8 mm Glass Stone Mesh-Mounted Mosaic Tile (10 sq. ft. / case) SGLS-MONBLND8, leave review and share Your friends.